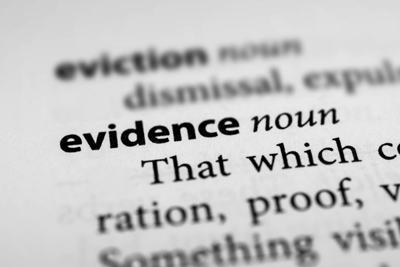 Evidence is a critical part of a personal injury case. After sustaining a serious injury it’s unlikely that you will be concerned about gathering evidence to prove the other party was at fault. It’s most important that you think about your recovery but the sooner you can collect evidence and speak to witnesses after an accident the better. In order to receive the compensation you deserve, you might consider hiring an attorney to work on your behalf. They understand that gathering, preserving and presenting evidence is important in successfully settling a case. Many times a piece of physical evidence from the scene of the accident can prove negligence. Physical evidence is something that you can see and touch as opposed to a statement of what happened or a description of the injuries the victim sustained. Examples may include a dent on the fender of a car from a rear end collision, a broken sidewalk where someone fell, a cracked helmet from a bicycle crash or torn and bloody clothing from a pedestrian accident. If there is no physical evidence that can be found or preserved, the next best thing is to take photographs and video. Being able to take photos and videos with our cellphones makes this process a lot easier. Take as many photos as you can and be sure to get them from multiple angles and distances. After a serious accident, the police and first responders will be involved. Once the police arrive they will talk to any eyewitnesses, observe the scene and then prepare a police report. The police report will usually include the date and time of the accident, the weather conditions, names of all parties involved, names of any witnesses, and other information surrounding the circumstances of the incident. Documentation on all the injuries sustained and the recovery after is a crucial part of getting the compensation you deserve. Medical evidence will include your medical records from all the doctors and medical professionals you saw, photographs of your injuries, and an injury diary of your recovery if you kept one. Depending on where the crash or incident occurred you might have eyewitnesses that saw it happen. It is important to locate all of the eyewitnesses so you or your lawyer can get a statement from them. Family members and coworkers are other witnesses that can comment on your injuries, recovery and whether or not you missed work and how it affected the job you’re doing since the injury. An expert witness is someone that has expertise, training or specialized knowledge that pertains to certain aspects of the case. Every case is unique so the circumstances of the injury will determine if any expert witnesses are necessary. These witnesses may include experts in the filed of safety manufacturing and engineering or it might be possible that an accident reconstructionist is needed to recreate the crash to determine how it occurred. An economist or vocational expert might be needed to calculate the lost wages and loss of the ability to work in the future. Expert witnesses are not needed in every case, but when they are used they can be very persuasive in arguing your case. As soon as you are able, you should hire an attorney so he or she can engage the right person to return and collect any evidence and photograph the surrounding conditions of where the accident occurred. They will be looking for such things as skid marks on the road, a defective crosswalk sign or there’s no appropriate lighting where there should be. A skilled investigator will attempt to locate video footage from nearby businesses as well as interview residents near the scene. Some crashes will require recreating the conditions such as time of day, location of the scene and others. Try to preserve any physical evidence exactly as it was after the accident. This may require storing it in a location where the condition of it remains intact and away from tampering. Be sure to photograph the physical evidence. And in addition, all photos and videos should also be backed up on a computer or flash drive. It’s always easier to obtain documentation closer to the date of the accident. If the police were called to the scene be sure to request a copy of the police report. If there were any eyewitnesses at the scene this report should have their contact information. It’s crucial to speak to all eyewitnesses as soon as possible. Unfortunately, the longer you wait to speak to a witness, the more difficult it will be for them to recall exactly what happened. If you weren’t taken away in an ambulance after the accident be sure you promptly see your doctor for any injuries you sustained. Be honest about all of your injuries so that your medical records are accurate. Not seeking immediate medical treatment will lead the other insurance company to believe your injuries aren’t serious. Also, be sure to take photos of all your injuries. Visible injuries heal and will not look as serious later, so be sure to take them as soon as possible. If you have been hurt by the wrongdoing of someone else, you need to be compensated for your injuries. This is why evidence is so important. All too often, accident victims don’t take the necessary steps to document their injuries and obtain the necessary evidence because they believe their case will settle. What they fail to know is that a successful settlement is the result of good, reliable evidence that proves the other party was at fault for their injuries. Our legal team at Jim Dodson Law understands that collecting, preserving and presenting evidence can be very complicated and overwhelming. We have been helping injured victims in Florida for over 25 years and we are here to help answer any questions you have. Contact us online or call our office directly at 888-207-0905 and we will be happy to help you.